Abstract. Environmental seismology is the study of the seismic signals emitted by Earth surface processes. This emerging research field is at the intersection of seismology, geomorphology, hydrology, meteorology, and further Earth science disciplines. It amalgamates a wide variety of methods from across these disciplines and ultimately fuses them in a common analysis environment. 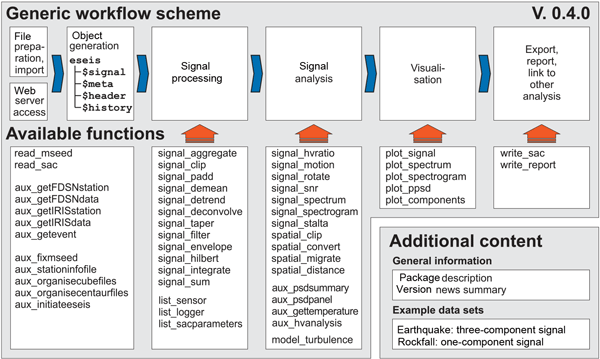 This overarching scope of environmental seismology requires a coherent yet integrative software which is accepted by many of the involved scientific disciplines. The statistic software R has gained paramount importance in the majority of data science research fields. R has well-justified advances over other mostly commercial software, which makes it the ideal language to base a comprehensive analysis toolbox on. The article introduces the avenues and needs of environmental seismology, and how these are met by the R package eseis . The conceptual structure, example data sets, and available functions are demonstrated. Worked examples illustrate possible applications of the package and in-depth descriptions of the flexible use of the functions. The package has a registered DOI, is available under the GPL licence on the Comprehensive R Archive Network (CRAN), and is maintained on GitHub. How to cite: Dietze, M.: The R package “eseis” – a software toolbox for environmental seismology, Earth Surf. Dynam., 6, 669-686, https://doi.org/10.5194/esurf-6-669-2018, 2018. Environmental seismology is the study of the seismic signals emitted by Earth surface processes. This emerging research field is at the intersection of many Earth science disciplines. 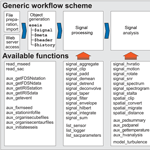 The overarching scope requires free integrative software that is accepted across scientific disciplines, such as R. The article introduces the R package "eseis" and illustrates its conceptual structure, available functions, and worked examples.